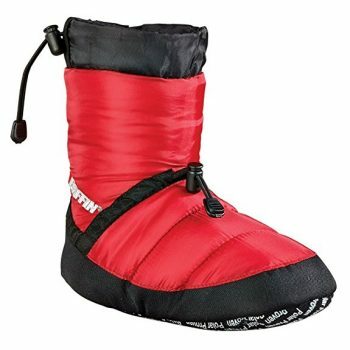 Best Camp Booties: Give the Boot to Cold Feet! Nobody likes to have cold feet. 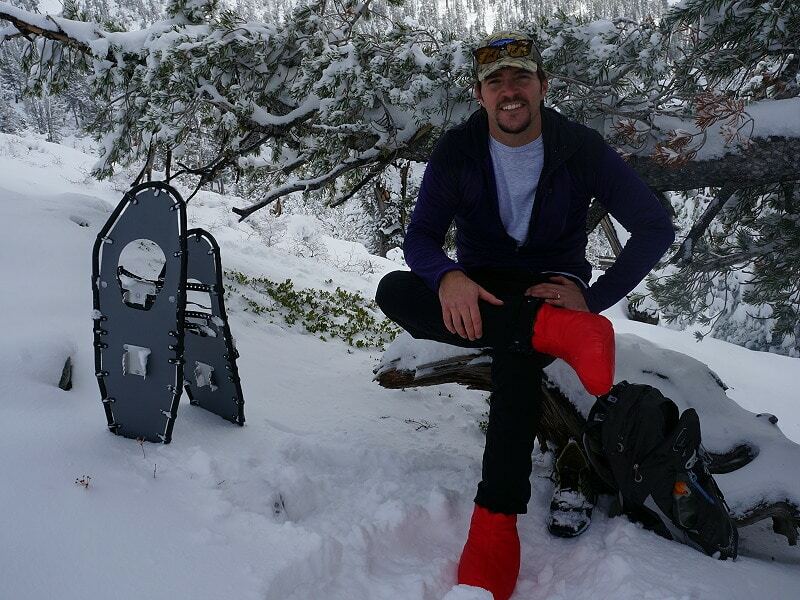 Whether you are just kicking around the house and yard, or pitching camp, 10 miles in to a 3-day wilderness adventure, cold feet are a kill-joy. Military commanders have long understood this problem and have striven to keep their soldiers’ feet warm and dry and therefore ready for the fight. In fact, a quick look back at the history of footwear will show that Man has battled this problem for millennia, with varying degrees of success. 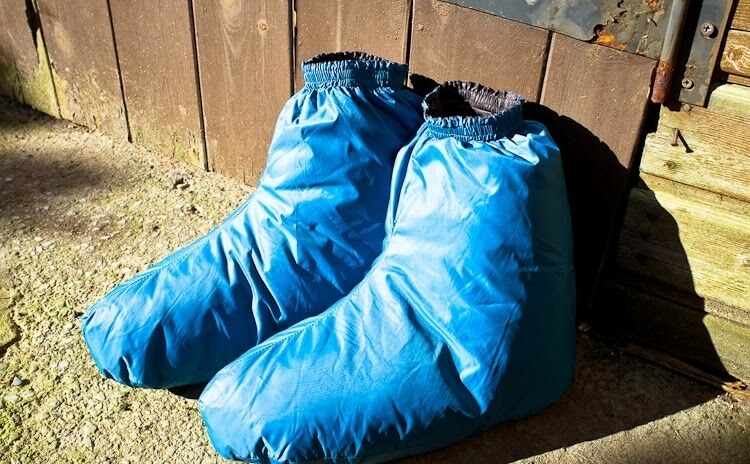 Fortunately, technology has caught up to this age old problem and provided us with the best camp booties to keep our feet warm and dry, regardless of what we are doing. That said, a relatively cursory analysis finds that most owners, prize them for a variety of common characteristics ranging from weight to warmth, durability to donning ease, comfort to cost, and of course, the extras. To spare you having to do the research yourself to find that very best fit, we’ve taken the most favored features, and compared those to the most popular brands. All of the brands we analyzed are readily available at your favorite online retailer and none, in the best judgment of this author, require the donation of an arm or a leg to acquire a pair. Read on below to see if you’d like to walk a mile in these shoes! In no particular order, following is our review of the most popular brands. Polar Feet Camp Booties seem to be a popular item as they appear to be in short supply on most every online retailer that features them. Scarcity can sometimes be an indicator of value and long-term worth. Think .22 LR caliber ammunition? Constructed of a combination of polyester fill, rubber outsoles, rip-stop nylon uppers, and memory foam insoles, these booties scream warmth. Couple that with two toggle cinches to keep out the snow and/or cold air, and your feet are sure to be toasty. On an interesting note, Polar Feet does maintain that the booties are “washer friendly” suggesting a decent durability. Better yet, wash-ability suggests a solution to that other age-old problem – stinky shoes! Because of the two toggle cinch design (one at the ankle and the other above the ankle), slipping these booties on is an easy feat. The outer soles are not ribbed and therefore they won’t track in mud or snow, but you would definitely need to exercise caution on ice. Again, taking note of the construction materials, it would seem to be a no-brainer that these booties are comfy. A reviewer on the Polar Feet website confirmed that assessment with a simple post stating that they were, “Amazing. Warm and comfy.” These stylish booties won’t cost you a fortune but they are in the mid-range of our selected samples. They won’t be mistaken for hautecoture, but what do you mind when you’ve got your feet kicked up as you sit next to a cozy campfire in the woods? You know what’s important to you! Related: Polar Feet offers a full line of variants on the camp bootie both in color options as well as in over the ankle or over the calf coverage. 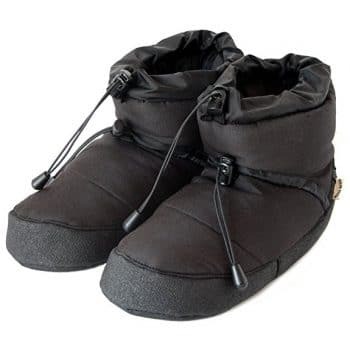 Cotswald Men’s Camping Bootie Slippers are great for those looking for the warmth of a bootie without the pinch in the pocketbook. Constructed of all man-made materials, these booties take advantage of the benefits of technology to provide toe-tapping warmth. The faux-fur upper collar with cord fastener ensures a solid barrier against the cold below the ankles. Although detailed reviews of this product are not too numerous, the average customer review was fair. One customer review on a retail site suggested the durability was not up to their standards. But, in fairness, the reviewer did not specify how they used the product so drawing any conclusions could be difficult. Possibly the easiest bootie to don, these feature a single draw-tie to loosen or cinch up depending on whether you are donning or doffing the warmth. This author would like to see a second draw-tie to act as a thermal or moisture barrier above the ankle but that isn’t necessarily a deal killer. These booties, on a purely visual level, seem to offer a high level of comfort. An unbiased observer of this analytical process (author’s daughter) commented that the booties seemed to be “sleeping bags for the feet”. Very hard to argue against that comfort endorsement! These svelte booties are at the lower cost end of our selected samples. Perhaps you can use the spare change for a portable rocket stove and a campfire hot chocolate set, all the while enjoying warm feet. Related: Cotswald does have a full line of this same style of bootie for women as well – see our review below. As you’d imagine, the colors span the rainbow and, of course, all are guaranteed to keep you warm for a low price. 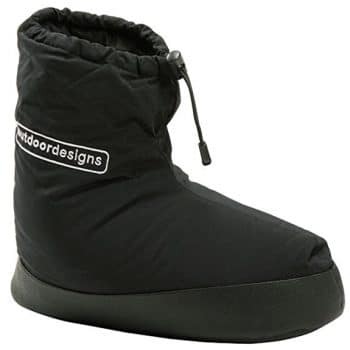 Outdoor Designs Men’s Down Booties are a great mix of old-school warmth (think fluffy warm down) with modern stay-dry technology. A water-resistant outer shell fitted with a pull cord keeps out the elements while a luxurious layer of down keeps your feet immersed in toasty comfort. The padded soles further ensure you don’t feel the nip of the tundra beneath you. These booties have a decently lengthy history of popularity and reviews, with the majority of the comments trending above average with good recommendations for features such as comfort and warmth. However, there was a small contingent of customers that felt the durability of the bootie was not to their satisfaction. Of particular note was a comment that brought up the valid point that duck down is great until the quills start poking you! Donning the booties is not as easy as others due to the internal elastic strap. On the one hand, the strap provides a foot hugging warmth, and on the other, it makes sliding on the bootie more of a two-hand endeavor. The comfort of the bootie (assuming the down retains its quills retracted) seems to be exactly what is called for on those cold camping nights. And, although the price range is steeper than other booties sampled here, these booties do come with their own handy mesh carrying bag which will save you space in your backpack. Cotswald Women’s Faux Fur Slipper Booties are essentially identical to the men’s booties covered above…just with a more gentile name for the ladies’ product and rugged name for the men’s. 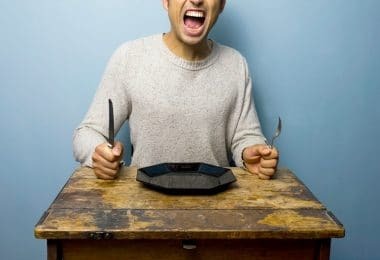 Marketing – isn’t it great? So, like the men’s bootie, the ladies’ version is also constructed of all man-made materials, providing an element-resistant environment to wrap those toes in luxuriant warmth. The faux-fur upper collar with cord fastener ensures a solid barrier against the cold below the ankles. Like the men’s version, this author could find few customer reviews for the ladies’ variant, however, given the same construction, it would be fair to say that the durability is the same as well. As previously noted, these booties are a cinch to don! 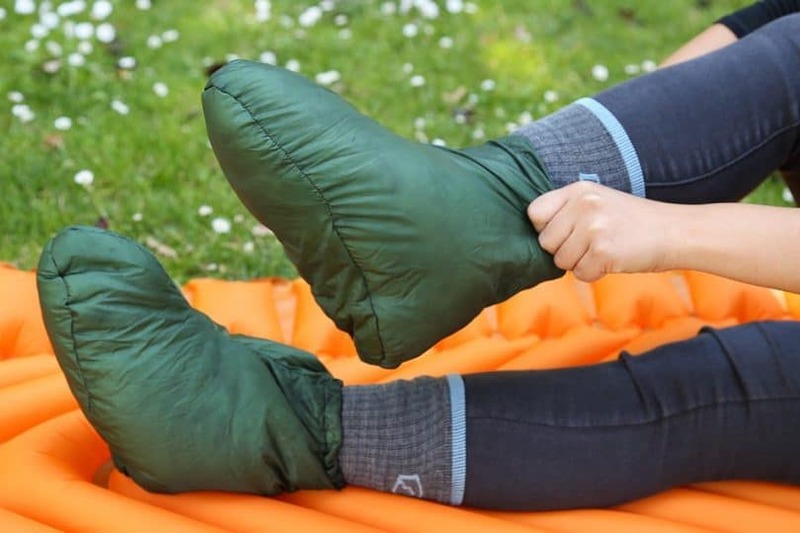 Featuring a single draw-tie to loosen or cinch up, the camp bootie fashionista is mere seconds away from the inner warmth of the bootie, or the chill of the external environment. The ladies’ booties offer a high level of cocooning comfort, especially after taking a load off the feet, and propping them up after a long day hiking (yes, urban hiking counts too)! These charming booties can be found for an even lower price than the men’s variant, making them a real value. Take the money saved and buy a pair, or three, in your other favorite colors. These North Face Thermoball Micro Baffle B camping booties are very likely the most stylish of the samples reviewed. From the WinterGrip rubber sole designed to walk on ice and in snow, to the taller upper with faux fur topping, these booties keep the wearer’s feet warm, and stylishly rooted to the ground. The Thermoball insulation wraps the feet in welcome warmth whilst the water resistant upper keeps them dry. Fitted with a single pull cord at the top, it cinches snug to keep the warmth in, the moisture out, and the bootie in place where it should be. North Face has a long history of designing products for outdoor pursuits and these booties fit right in. A plethora of reviews speak strongly to the quality and durability of these booties, to the extent that many customers tend to be enthusiastic, and repeat customers. However, a common thread amongst those who were dissatisfied with the booties, was that they felt that they were sized on the small side. So buyer beware, and consider allowing for an extra half-size when ordering, at the very least to accommodate for thick socks! Donning the booties is relatively easy though some customers found them a bit harder to don than regular ankle height booties due to the height of the upper as well as a sewn-in elastic around the ankle area. The comfort level is on par with the other booties reviewed with one reviewer marveling at how dry and comfortable they kept her feet, even without socks. The versatile Thermoball Micro Baffle B booties span a large price range so depending on where they are sourced, they can pinch the purse. That said, cheap is not necessarily good, and good is most often not cheap. 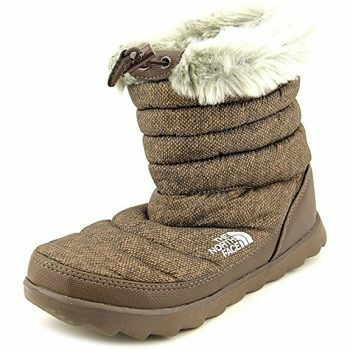 Related: As would be expected with North Face, there is an extensive line of similar women’s camping booties but if warmth (and style) is the goal, then the line that uses the Thermoball Micro Baffle B technology would be of interest. Specifically, take a look at the Thermoball Microbaffle Bootsie II Boot and the Thermoball Button-Up Boot. 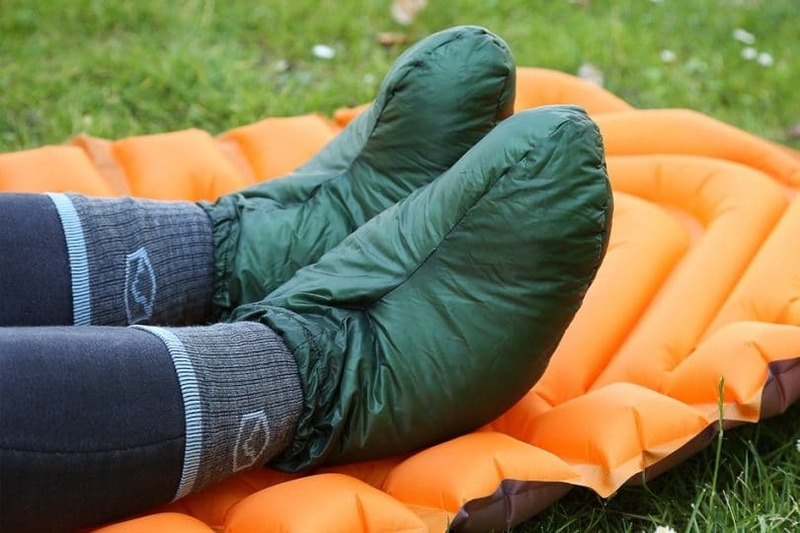 The Baffin Base Camp Slippers are one of two designs that we reviewed that were more in the vein of single purpose booties/slippers, foot warmth, as opposed to the more multi-purpose variants we have reviewed thus far. With that understanding in mind, then the design and functionality of these booties are very much spot-on. The light-weight nature of the insulated nylon upper along with the synthetic molded sole allows the wearer to have the best of warmth with the least encumbrance of shoe mass. The slippers may look awkward (one reviewer thought circus clown shoes) but substance over style is where it is at, especially after a long day and all you want is warm, rested feet! 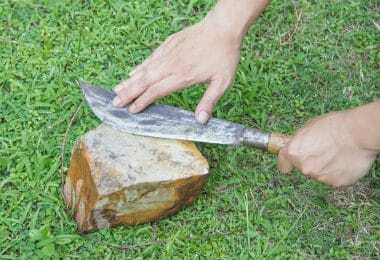 The sole is a marvel in manufacturing technology, however, numerous customers felt that the rubber grips on the soles wore off too quickly, casting some doubt on their outdoor durability. However, of all the booties we reviewed, these actually received the highest volume of customer feedback, the preponderance of which was positive which speaks to the quality of the product. Donning the booties is fairly easy, and, once on, simply cinch up the two draw strings for a warm, snug fit. Remember, the intent is to kick back and relax with comfortable feet…no running 5-k trail runs with these! The price for these booties is firmly on the lower end of the mid-range to all other products we compared. And, again based on the number of satisfied customers, it appears to a solidly good value. 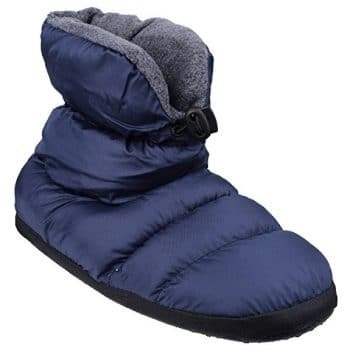 Related: Many of the people that chose to purchase the Baffin Base Camp Slippers, did so because they were fans of another Baffin product – the Baffin Unisex Cush Insulated Bootie. Unlike the slippers, this bootie is closer to what you might expect in the environs of a camp site. However, like the slippers, it appears the sole may be prone to some of the same drawbacks. 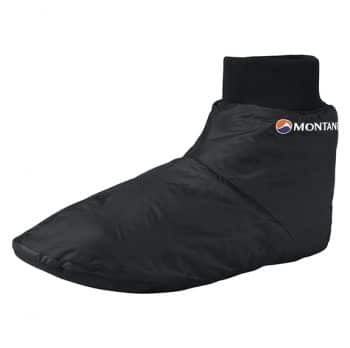 The Montane Men’s Fireball Footie is, like the Baffin product, the other of the two slippers/booties that we reviewed that is more single-purposed in nature (foot warmth) than multi-purposed. uper light-weight and warm…can’t go wrong with that. Unique to this product is that rather than use a drawstring, the Montane uses a ribbed ankle cuff to ensure a most comfortable fit. If used as designed, this camp sock should give the wearer years of great use. Like the Baffin, it would not be advised to go trail running in these as the results could be…no fun. Donning these camp socks is no more difficult than putting on a pair of socks and, in fact, is easier since they are not nearly as restrictive as, say, wool socks. That said, it would still probably be a two-hand endeavor. The price point on these camp socks is, in this author’s opinion, on the higher end of a single purpose item. But then again, people don’t think twice of paying this much or more for a good pair of hiking socks. It really is all relative and, at the end of the day, a happy pair of feet is payback enough. So, now that you have seen the wide variety of booties, slippers, and camp socks out there, what’s left to do but equip yourself with the best choice for your needs. Remember, there is really no ‘right’ answer out there but there is what might fit your situation best. 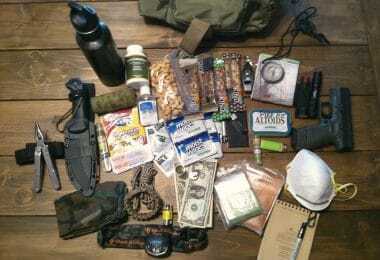 If you are an avid hiker or camper, some of the products would be more apt to suit you. If hanging around the house and garden are more your style, then your choices might be different. What is the same, regardless of your choices, is that all of these products will keep your feet warm, dry, and in good health. Your feet will definitely tell you, that is something to smile about! So do your feet a favor, don’t drag them.